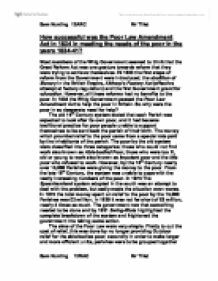 How successful was the Poor Law Amendment Act in 1834 in meeting the needs of the poor in the years 1834-41? Most members of the Whig Government seemed to think that the Great Reform Act was one gesture towards reform that they were trying to achieve themselves. IN 1833 the first steps of reform from the Government were introduced; the abolition of Slavery in the British Empire, Althorp's Factory Act (effective attempt at factory regulation) and the first Government grant for education. However, all these reforms had no benefits to the poor. In 1834 the Whig Government passed the Poor Law Amendment Act to help the poor in Britain. So why were the poor in so desperate need for help? The old 16th Century system stated that each Parish was expected to look after its own poor, and it had became traditional practice for poor people unable to support themselves to be sent back the parish of their birth. The money which provided relief to the poor came from a special rate paid by the inhabitants of the parish. The poor by the old system were classified into three categories; those who could not find work also known as Able-bodied Poor, those who were too ill, old or young to work also known as Impotent poor and the idle poor who refused to work. ...read more. The poor lived in poverty and inhumane conditions, whilst the rich lived in luxury, but the Poor Law was a success in meeting the needs to an extend. Between 1830-4 the average annual expenditure on poor relief had been around �7 million, however, by 1935-9 it had reduced to �4.5 million. This was also very popular with the tax payers as they had to give less to the poor. The Law was also effective as it showed that the Government/state was responsible for the poor and was able to set up a uniformed system, instead of 15,000 different systems for each Parish. The system did allow the sick, impotent or old to be looked, and discourages poor people to have any more children which long term did keep population between poor people down. The system also was designed to be a deterrent and not so much a punishment to the poor which many believed, the act in operating was not as tuff as the terms of the act, as an example outdoor relief was still given out in cities because of the amount of poor it would've been impossible not to give any help. ...read more. There would have also been psychological damage as many found it hard to leave the workhouse as well as going into the workhouses. Even though the uniformed system was in place, it was not usually applied correctly, different places had different poverty and the uniformed system did not allow any adjustments for this, such as in the cities. In the south, depressions in agriculture meant high unemployment in the late 1803's and resultant in high cost of relief, whether indoor or outdoor. The response of many working people to the obligation of the so called "starvation Law" was to disagree that the only way to improve their living conditions was through Parliament that fully symbolize working people. In conclusion I believe that the Poor Law amendment act was a good first attempt of helping the poor in poverty and inhumane conditions and showed that the responsibility of the poor was still the Government. Nevertheless, the Law was seen as a punishment and did not deal with the causes of poverty, in many cases made the situation even worse. As you can see in this essay there were still many unanswered questions and the poor remained in poverty, unemployed and desperate. ?? ?? ?? ?? Sam Nurding 12ARC Mr Tillet Sam Nurding 12RAC Mr Tillet ...read more. There is no trace of the obsolete field at all. When a record has to be deleted within a paper-based system, the record needs to be located, removed from the file and binned. In an ICT-based system, that record can be located instantaneously and deleted via clicking on the delete button. Also many of the calculations were incorrect and took too long to work out. However, when designing the system the main obligation was to keep the system simple and easy to use. Ultimately if it is simple and easy to use, then it wont take long to work out how to use it. Data cannot be queried. Desktop Publishing Software (such as Microsoft Publisher): These packages can be used to create promotional material for an organisation, such as posters. They enable the insertion and manipulation of graphical images. However, beyond that they are rather limited in what they can do. The system managed to keep workers happy during times of high food prices and low wages. Many cynics argued that the added allowances for children influenced people to get married earlier and to have larger families, therefore making the problems of growing population worse.